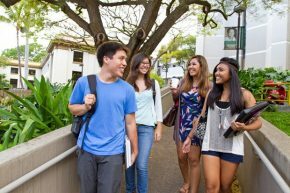 Hawai‘i P-20’s latest College and Career Readiness Indicators Report (CCRI) for the Class of 2017 shows that programs and policies designed to boost student achievement and strengthen successful transitions between high school, college and career are continuing to prove effective. Good news! 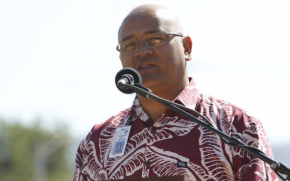 Updated data from the U.S. Census Bureau shows that Hawai‘i is moving towards our 55 by ’25 education goal. 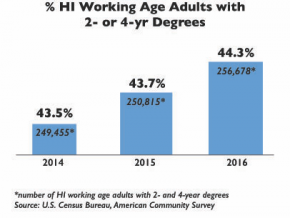 From 2015 to 2016, 5,863 more of Hawai‘i‘s working age adults (over the previous year) have a two- or four-year college degree, increasing our percentage to 44.3%, up from 43.7%. 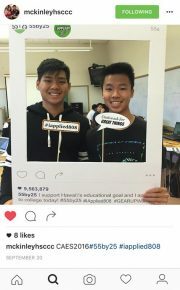 High school students in Hawaiʻi are earning college credits at rapidly rising rates thanks to a collaboration between the University of Hawaiʻi and the Hawaiʻi Department of Education called Early College, which offers the opportunity for students to take college courses at their high school and earn credit toward their high school graduation and college degree. This year’s Class of 2017 seniors had the highest number of Free Applications for Federal Student Aid (FAFSA) completed in the past four years statewide. 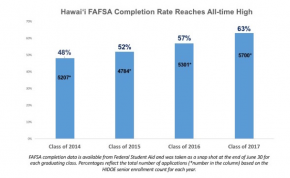 Hawaii State Department of Education (HIDOE) high school graduates are better prepared for college and are enrolling at four-year campuses at higher rates than ever before. 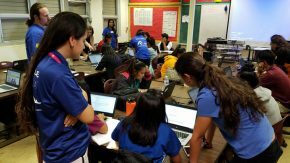 “We’re continuing to see a positive trend in terms of the degree to which students from our public schools are prepared for college and careers,” said Stephen Schatz, executive director of Hawaii P-20. 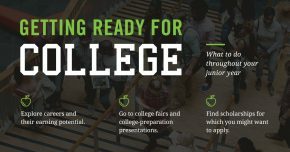 New data shows students are better prepared for the rigor of college coursework. 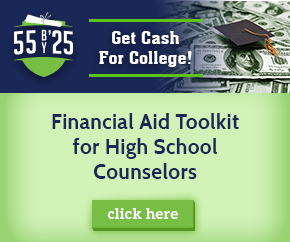 Financial aid outreach continues to be a focus for the 55 by ’25 campaign. October 1st marked the start of the FAFSA (Free Application for Federal Student Aid) season for the 2017-18 school year. 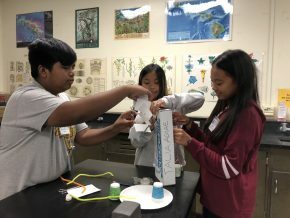 During the past couple months, over 650 students from Farrington, Kealakehe, Leilehua, McKinley, Wai‘anae and Waipahu high schools have filled out an application with more events scheduled to occur at other schools in the coming months.